Arrange the filters at the top of the page then click “list” at the bottom of the box. Once you get your list the way you like it (with a manageable number… say… a few hundred? 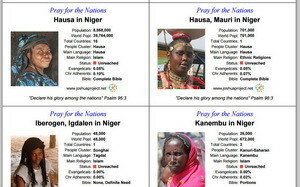 ), click “prayer cards.” Bam. The new sub-routine will automatically prepare a PDF printable document with handy prayer cards focused on your select set. Thank you Dan and all the folks at JoshuaProject.net!